Primary Lens Luxation is caused by an inherent weakness and degeneration of the ligaments that suspend the lens. Primary lens luxation can be inherited in many breeds, including several terrier breeds, Border Collies, Brittany Spaniels, Australian Cattle Dogs, and Shar Pei’s. In these breeds, spontaneous luxation of the lens occurs in early adulthood (most commonly 3-6 years of age) and often affects both eyes, although not necessarily at the same time. The lens is the focusing structure of the eye, known as accommodation. It is suspended in place by small fibers or ligaments, and is located immediately behind the iris and the pupil. If these ligaments that suspend the lens break down, the lens may become partially unstable and may partially dislocate (sub-luxated) or fully dislocate (luxated) from its normal position. Movement of the lens forward through the pupil into the front half of the eye is called Anterior Lens Luxation. Movement of the lens backwards into the back half of the eye is called Posterior Lens Luxation. Lens Luxation can also occur secondary to other primary problems of the eye, including inflammation, cataracts, glaucoma, cancer and trauma. Lens Luxation can lead to inflammation and glaucoma (increased intraocular pressure). This can result in painful, teary, red eyes that may look hazy or cloudy. Irreversible vision loss may occur if this condition is not addressed immediately. If detected early, surgical removal of the lens can be beneficial. 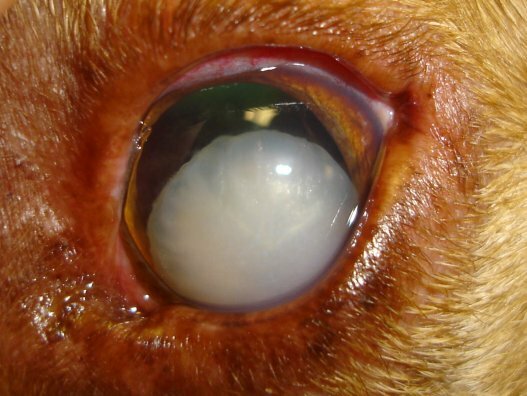 Unfortunately, there is a high risk of complication with lens removal; all animals will experience inflammation and will require lifelong topical medication. Glaucoma is not uncommon following lens removal and can lead to blindness. Retinal detachments and bleeding are also potential complications of surgery. Other surgical procedures can be performed at the time of lens removal to reduce the chance of these complications. When a lens is removed, your pet will be able to see, but will be hyperopic (farsighted). Posterior lens luxations may be treated with medications to constrict the pupil, which traps the lens in the back portion of the eye, where it is less likely to cause a problem. Even with this medical treatment, it is still possible for a posterior lens luxation to become an anterior lens luxation. If the eye is already suffering from severe inflammation or glaucoma, eye removal, or a procedure to place a prosthetic eye, may be recommended.